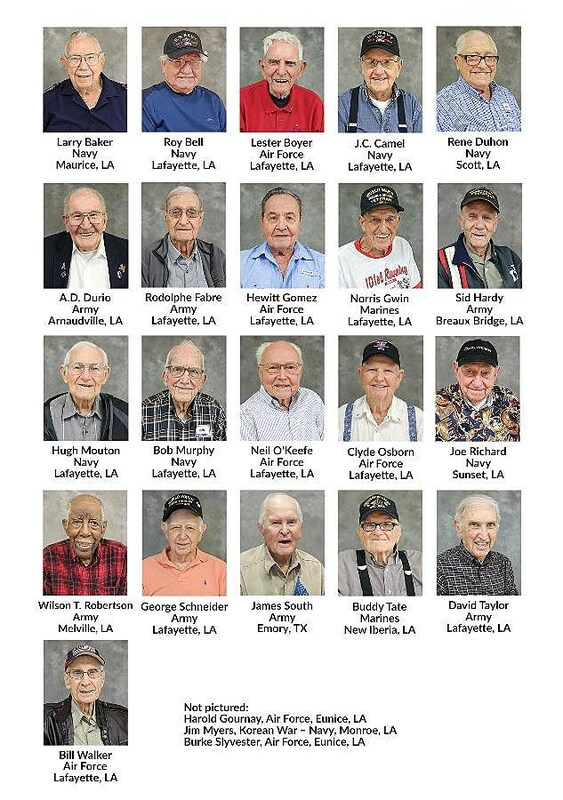 The all-expenses paid trip is to honor these veterans for their service and sacrifices. The send-off event will begin around 8:30am on Monday, May 28 (Memorial Day) at Lafayette Regional Airport. The group is scheduled to return on Wednesday, May 30 at approximately 4:50pm. The community is invited to attend both the send-off and welcome home events. While in D.C., the group of veterans will visit the WWII Memorial, tour the U.S. Capitol and the Air and Space Museum. Other points of interest will include Arlington National Cemetery and memorials honoring the U.S. Marines, Navy, Air Force, Abraham Lincoln, Franklin D. Roosevelt, Martin Luther King Jr., and Vietnam and Korean War veterans. Since establishing the Heroes Flight program in 2010, BGC has taken 415 veterans from Texas, Louisiana and Arkansas to Washington, D.C.
Below is the complete list of the veterans going on this upcoming trip.